and of course enact the data retention bill which would mandate ISPs and phone companies to store all traffic data of everybody in Germany for 180 days, with the police (after court approval) and intelligence agencies being able to access it. The working group on data retention, a network of civil liberties organizations and other groups and individuals, has been organizing the resistance over the last year. They had two demonstrations last year which gained little attention and attracted lesst than 300 persons, partly due to short notice planning because of a parliament ruling and other circumstances. But now, the issue seems to have gained enough salience. It is reported on the front pages now, not in the "computer∫ernet" section where it used to be hidden. Last saturday, we saw the result: More than 2000 people gathered in Frankfurt on a nice sunny day for the biggest demonstration for privacy since the 1980s. Supporters have been very wide-ranging, from radical anti-fascist groups to the opposition parties and the federation of women's emergency call centers. The ISP associations did not officially support this, but a lot of them helped with logistics behind the scenes. Many of the ISP workers from Frankfurt also took part in the demonstration. The working group against data retention has also gathered more than 12 000 supporters for a constitutional court challenge against data retention since November. It will be submitted on the day the bill is enacted. This will be the largest constitutional court case in Germany ever. The adoption of the data retention bill a few days after the demonstration, as well as Schäuble's plans, combined with an unclear statement by him on the presumption of innocence, have led to an outcry in the last few days. The said-to-be-non-political German blogosphere discussed these developments at a large gathering in Berlin last week and, as a follow-up, has issued a call for creative resistance. Many people had nice ideas. 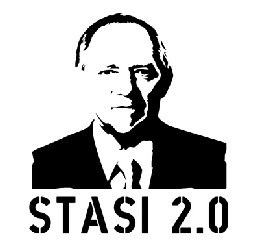 Above all, blog posts that contain "Stasi 2.0" (a reference to East German secret police) with a picture of minister Schäuble are spreading quickly at the moment. Some have taken it to the offline world, too. Examples are here and here. T-Shirts will be available soon. A pledge to donate 5 Euros per month for the fight against data retention has also attracted a number of people. 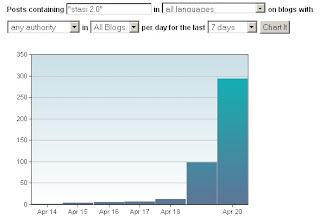 Technorati has seen an exponential growth of "Stasi 2.0" in the blogosphere. For a short while, "Stasi 2.0" even was the most popular search term that came out of the German language space (technorati ranking #13). This week might be remembered as the moment in history where German bloggers noticed their power for distributed and creative political campaigns. At least, they have found a common enemy now. The journalists' and publishers' organizations saw the secrecy of their sources under attack by the data retention bill, and most mass media have more or less openly positioned themselves against the plans. Leading Social Democrats are openly moving away from Schäuble, and some have even compared his attitude to Guantanamo. Even a few prominent conservatives have tried to slow him down (one even said he has to think of Orwell), and the police union has openly questioned the necessity of these measures. The activist movement is already discussing the next demonstration and setting up local and regional groups. The working group on data retention now calls for chapters and members of the ruling parties SPD, CDU and CSU to sign an open letter against data retention. The "virtual local chapter", the internet branch of the Social Democrats is already supporting it. It will be crucial how the Social Democrats position themselves in the mid-term. The polls still show support for the current domestic security policy (no questions about recent plans yet), but Schäubles popularity has dropped (from 0.8 to 0.5 on a scale from -5 to +5). With the whole opposition, the majority of the media, large parts of the relevant industry, the churches and most societal groups against surveillance in this debate, it is likely that this will become an even hotter topic and a potential breaking point for the grand coalition in the coming month.